This tasty soup is nourishing, hearty and slow-cooked, allowing for easy absorption of the immune-supportive nutrients it contains. Any other vegetables may be added such as peppers or kale. 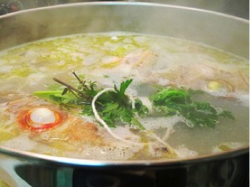 The soup stock is best homemade as it increases the nutrient density and is a great way to get the most out of chicken or other bones. If you prefer vegetarian, you can collect the unused scraps of onions and veggies in a container in your freezer until you are ready to make a vegetable stock. See the "health" tab above for tips on how to stay healthy and boost your immune system. Simmer chicken breasts in stock for 1 hour. Check periodically to make sure the water doesn’t boil away; add more water as necessary. During the last half-hour, add garlic, ginger onion(s), mushrooms, cabbage and sweet potatoes. Add spices if dried here (if fresh, add at the end). You can also add the carrots and cabbage now or wait for another 15 minutes. Add coconut milk and simmer for another 10 minutes without boiling. Remove from heat. Add tamari (or salt), miso, cayenne pepper and other fresh seasonings to the broth. A squeeze of fresh lemon or lime also tastes good right before serving. A second option is to put it all in a crock pot until the chicken is well done. Enjoy. Cheers to your health! Thai Coconut Soup - "Tom Kha Gai"
A traditional Thai coconut soup, called Tom Kha Gai, that far outdoes your basic chicken soup in flavor and quality. It is perfect for cold winter days and preventing colds and flus due to it's immune supportive qualities. Made with many fresh ingredients, this flavorful soup blends a combination of savory, spicy and sweet with a refreshing floral and citrus quality. Is naturally gluten, dairy and soy-free and can be easily adapted to be pescatarian (fish stock, shrimp instead of chicken) or vegan (veggie stock, tofu for chicken, tamari or soy sauce for fish sauce). Thai kitchen makes a fish sauce that is guaranteed gluten-free, though most fish sauces do not naturally contain gluten. Be sure to check this if you need to.There are many variations and this is the version I've adapted to after making it many times. Note: Making the traditional soup may require a trip to an Asian grocery store but this recipe can be easily adapted to ingredients found in most anywhere (this is what I often do when I make it last minute). I do sometimes buy extra lemongrass, kafir lime leaves and galangal ahead of time and chop and freeze them separately for future use. They keep quite well. 1 pound boneless skinless chicken thighs, cut to 1" pieces (you can use breasts, but the thighs are moister and tastier). You can also use bone in chicken parts. It will just be a bit messier when you eat it. 1-4 dried birds eye chili peppers crushed or 1/2- 1 teaspoon crushed red pepper flakes. Use these to taste and note that the more crushed they are, the spicier the soup will taste. Also, the longer they cook or sit in the soup, the spicier it will be. Sometimes the leftovers taste hotter the next day after sitting in the soup all night. Optional serving suggestion: serve over white or brown jasmine rice (cook simultaneously or before making soup). 2. Add: chicken, lime leaves (if using lime juice save until step 4), shallots (or onion), garlic and other optional veggies and stir occasionally until chicken is tenderly cooked. 3. Reduce to simmer and add: chili peppers or flakes and coconut milk. Do not boil at this point but just simmer for another 10 minutes to combine flavors. Add more chili pepper or flakes if needed and simmer for another few minutes to release their heat. 4. When you are ready to serve, turn off the heat. Add the honey, lime juice (and lemon if didn't use lemongrass earlier) and fish sauce (or salt to taste if needed) and stir well. If desired, add more of these things as needed to taste. You should be able to taste sweet, sour, salty and spicy together in a fragrant and complex flavor. 5. Top the soup off with chopped cilantro and serve by itself or over jasmine white or brown rice. Sometimes I like to use fresh chopped basil instead of or with the cilantro for a different but complementary flavor.